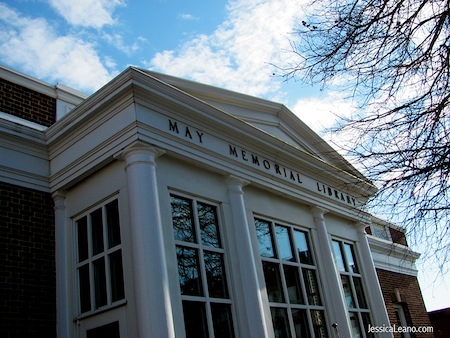 May Memorial Library, Burlington, N.C. In the technological age, with students taking notes frequently on computers, professionals relying on tablets for reading the daily newspaper, and nearly every form of entertainment, whether movie or music, available for instant download, the need for paper continually decreases. With the development of e-readers, the question of a library’s value in modern society arises. Without profits or sales, how have libraries, a public resource giving access to free books, been affected? Surprisingly, Americans continually rely on public libraries, which in turn, offer not just paper books or academic assistance, but also technological resources. The State of American Libraries Report’s 2013 results revealed that just over half of the respondents surveyed still visit a library. 40 percent of those surveyed check out DVDs, while 73 percent turn to the more traditional paper book. Dr. Anthony Chow, an assistant professor at the University of North Carolina at Greensboro, researches public libraries in North Carolina. Although e-readers’ popularity continues to increase, Chow says libraries will always be valuable resources. “Library services have evolved into much more than books in general – as a place for community, workforce development and employment, early literacy and children or youth programs, a place of refuge and ‘free’ entertainment, access to technology for those who don’t have it, and of course books, lots of books,” he explains. Chow is a faculty member in UNCG’s master’s degree program in library science. North Carolina Central University and UNC Chapel Hill also offer similar programs, where researchers focus on various subtopics of libraries in the U.S., including academic libraries, library history, and children’s library services and resources. Carmichael perceives two groups, neither consisting of young adults or college students, to be the primary and most consistent users of the library system. He views parents and their children as the first group, as libraries often offer free educational and recreation programs throughout the week. Alamance County Public Libraries offer a wide variety of happenings for families, ranging from not just the typical reading club, but to movie screenings, music and movement sessions for babies, and LEGO building hours.Based on Carmichael’s observations, libraries often offer valuable resources and play a vital role in the community by providing entertainment and respite for harried parents or caregivers. Cal Shepard, the State Librarian, echoes Carmichael’s statement that computers play a vital role in libraries’ popularity and value in society. However, she perceives the high cost of bandwidth to be one of the primary issues libraries face. 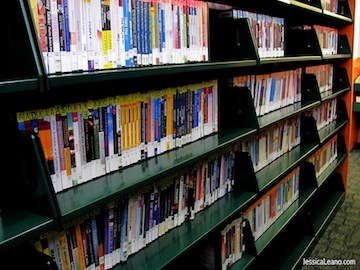 “I would say that one of the things holding libraries back is they can’t afford the bandwidth. And nationally, it’s my perception, and mine alone, that North Carolina is behind when it comes to offering bandwidth to its residents,” Shepard says. The lack of affordable bandwidth, rather than a lack of interest in books, is a key challenge libraries face in catering to the public, as wait lists for popular books in North Carolina still reach as high as 200 names. Ironically, she also sees the growth of the Internet as one of the main reasons libraries also struggle in receiving funding. Since anyone with a mobile phone, or merely access to the Internet, can easily research nearly any topic and receive an answer within seconds, the reference desk has become somewhat outdated. However, a study referenced in the State of American Libraries 2013 report revealed that 75 percent of first-year college students surveyed said they do not know how to find research articles and resources. Thus, the need for reference desks, as well as librarian assistance, despite the ease of researching online, is clear. Chow, Carmichael, and Shepard all agree that libraries will not become obsolete, as their resources are vital to education and serving the public. However, libraries must adapt to the community’s needs, especially in regards to e-books. Shepard likens the growth of e-books to the invention of the television. Although skeptics predicted the radio would be obsolete after television, both remain necessary for different purposes. She views e-books and paper books similarly. 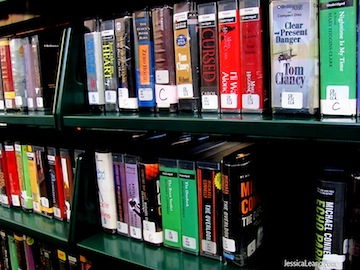 Despite the trend towards e-books, N.C. library shelves remain stocked. According to a survey of MBA students at the University of Virginia, the majority responded they would not recommend e-books for learning. Princeton University students similarly said using a digital book instead of a paper book was a detriment to their memory retention. Libraries play an integral role in learning by providing paper books for free and continue to provide a public service for patrons of all ages. Although e-books have not harmed libraries’ paper book collections, North Carolina libraries view e-books as assets, and aim to add them to their collections. Rather than viewing e-books as a threat, the library system has taken steps to foster a relationship with publishers to provide e-books to patrons. However, publishers are reluctant now to work with libraries. In the past, publishers and libraries were “friends,” Shepard says. After receiving new books, librarians would write reviews and encourage readership. Now, their relationship has changed. In early 2012, members of the American Library Association met with six of the nation’s top publishers, including Hachette, Macmillan, Penguin Group, Harper Collins, Random House, and Simon & Schuster, to negotiate for e-book lending. Penguin Group, which publishes bestsellers by Nora Roberts and John Green, placed an embargo limiting the release of new titles to libraries for six months. The embargo was later removed. Shepard explains, “The publishers literally are saying to us, we’re not going to sell to you. Now that’s night and day.” Thus, the business model of the library continually shifts, as libraries search for ways to respond to consumer demand and developing technologies. 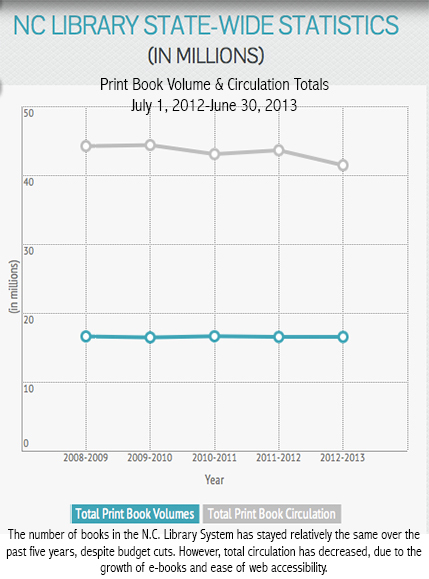 How has the e-book affected libraries’ print collection? Although North Carolina struggles to foster a relationship with publishers, its strength as a library system lies in its collegial system, where library branches work together to compile resources as public goods, rather than compete for funding or patrons. Fifteen years ago, the community college system, an organization of private and independent colleges, the UNC system, and the state public libraries banded together to create NC Live, a scholarly database available statewide, where resources include access to free e-books, journals, and videos. Shepard says the president of the American Library Association noted the state’s unique collegial system during a visit to one of the North Carolina Library Association’s conferences. Despite its strengths and national recognition as a strong system, North Carolina’s libraries still face economic adversity. 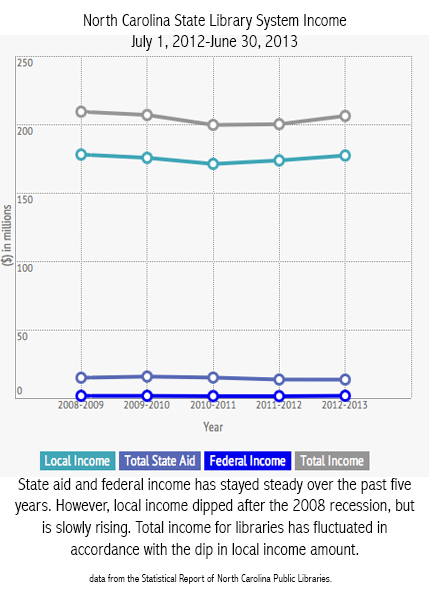 State funding has decreased by 9 percent over the last five years, making it even more difficult to equalize the libraries in the system. 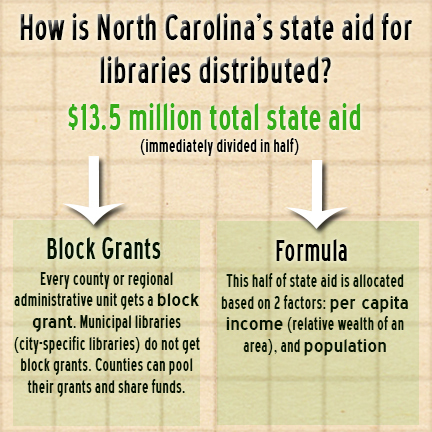 Since North Carolina’s libraries vary from urban to rural, libraries receive different amounts of funding, which explains the disparity in collections, whether print books alone, or DVDs and CDs as well. UNC Chapel Hill Clinical Assistant Professor R.E. 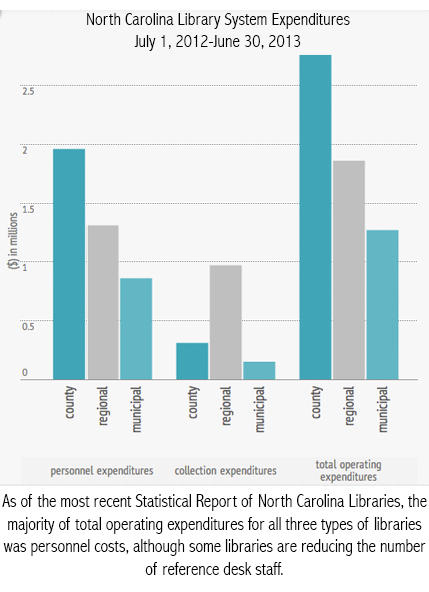 Berguist says patronage in libraries varies among North Carolina’s counties, with individual libraries’ ability to appeal to the community’s needs playing an integral factor in its success. “Durham County Southwest Regional Library and Wake County West Regional Library are both good examples of libraries that have astoundingly good patronage,” he says. 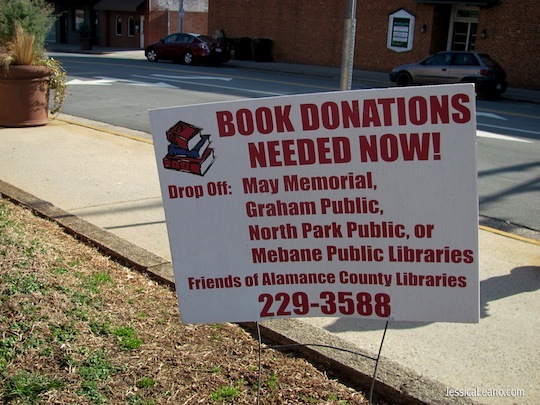 Based on his experience living in Alamance County, for nine years, May Memorial Library similarly had a steady number of patrons, while Mebane’s library did not, in his opinion, cater to the town’s needs. 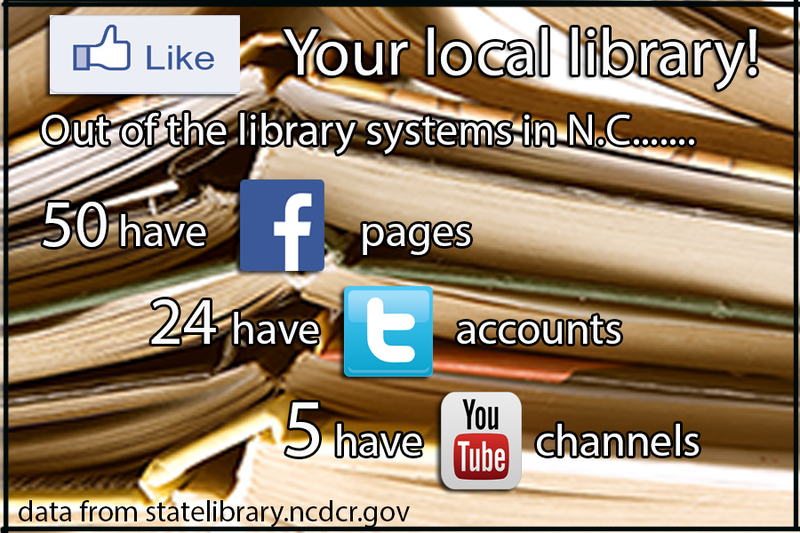 The Research Triangle also stands apart from other North Carolina libraries as has its own network, allowing patrons to access resources from UNC Chapel Hill, N.C. State, North Carolina Central University, and Duke University. Shepard says library visits are down just slightly, although a trend likely due to cuts to operating hours. Book volume per capita, the number of books in the system, has also slightly decreased due to budget cuts. Due to budget cuts, libraries are turning towards their community to increase their collection. As a result, academics like Chow and state employees like Shepard band together to advocate for the state library. Chow also contributes to a state advocacy blog, stressing the importance of libraries for citizens of varying ages. As National Library Week approaches in mid-April, they, along with elementary and middle school student ambassadors, plan to travel to Capitol Hill in May to lobby for more federal library support. The North Carolina Library Association is leading a national rally in front of the Capitol. To catch politicians’ attention, they plan to hold a flash mob to the song “Happy” by Pharrell, capitalizing on the dance craze and popular music. 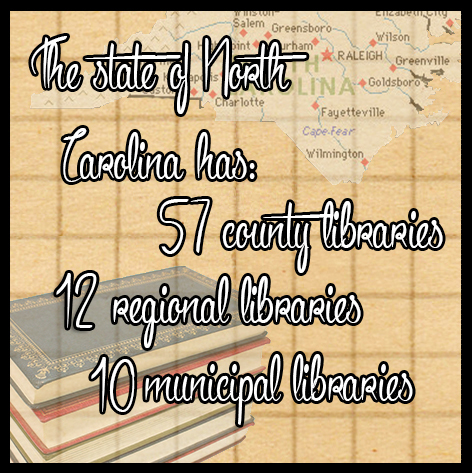 According to both statistics, and input from researchers, North Carolina’s libraries, despite adversity, are not in the midst of a downturn, but in a period of growth and modernization.